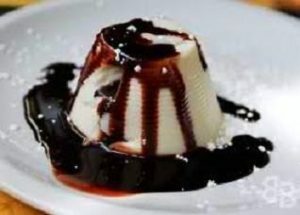 A silky smooth panna cotta flavored with white chilocolate and made even more decadent with a rich dark chocolate sauce. This White Chocolate Panna Cotta makes an elegant ending to any meal but is easy enough to prepare. Here is an easy dessert recipe for White Chocolate Panna Cotta with Dark Chocolate Sauce. Mix gelatin with 1/4 cup milk in a small bowl and et stand for 5 minutes until lumpy. Warm white chocolate morsels in whipping cream and sugar in a saucepan over medium-low heat. Stir the mixture occasionally until morsels are melted and sugar is dissolved. Remove from heat, and add gelatin mixture, stirring until gelatin mixture is well incorporated. Add in remaining 1 1/4 cups milk and mix well. Make sure there are no lumps. Pour mixture evenly into 4 to 6 dessert cups or 6 (8-oz.) ramekins. Cover top with kitchen wrap and chill for 24 hours. To make the chocolate sauce, microwave chopped dark chocolate bar and cream in a bowl at HIGH 1 1/2 minutes or until melted and smooth, stirring every 30 seconds. Serve chilled panna cotta with a drizzling of dark chocolate sauce on top and garnish with chocolate shavings and a sprig of mint.